This yellow ribbon bracelet has silver along with 2 charms. A heart charm that is engraved with the words "Where There is Love There is Life" and a yellow ribbon charm at the clasp. The sterling silver plated bracelet is 7 1/2 inches wide and has elastic to fit most any size wrist. This bracelet comes in a gift box with cotton insert in a beautiful white drawstring organza gift bag. 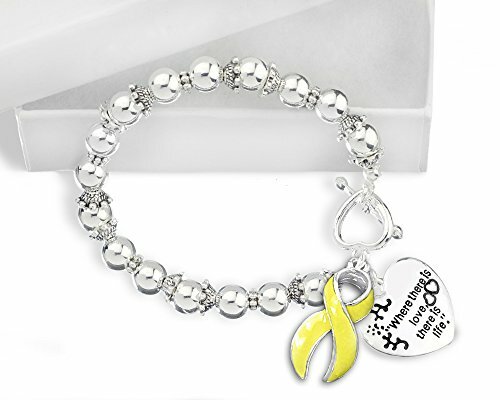 Spina Bifida Awareness Bracelet - With Silver Beads Along With a Yellow Ribbon and Heart Charms. Reads "Where There is Love There is Life"
Spina Bifida Awareness Charm Bracelet in an Elegant Gift Box.